Earlier this year, I was excited to launch Cooper’s Corner on my blog – these are recipes and ideas from my 11-year-old son. You can always visit my site at www.bubblyhostess.com to see everything we post. The rest of this column was written by him…enjoy! A few weeks ago, I asked my mom to ask on Facebook and Instagram what the readers would like to see me make next and from what I got back, I chose to make a cranberry appetizer from the idea of Denise Serafini. We used puff pastry sheets, but you can use puff pastry shells to make it easier. Combine cranberries, orange juice, and sugar in saucepan. Cook over medium heat stirring frequently, until the cranberries burst, which is about 10 to 15 minutes. Allow to cool. Roll out puff pastry sheets on a floured workspace. Cut puff pastry into approximately 3-inch squares. Coat a mini muffin tin with non-stick spray. Using a mini muffin tin, place each square into mini muffin cup and press down to fill the space. Bake for 10 minutes. Cut the Brie into small pieces. When the puff pastries are done, the pastries will puff up, push them back down to create a cup. Fill each one with 1-2 pieces of Brie. Put some cranberry sauce on top of the Brie. Bake for 5-7 minutes until cheese is melty. Meanwhile, toast the pecan halves in a saucepan. Remove puffs from the oven. 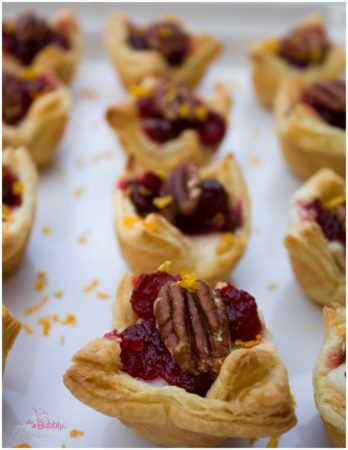 Top each with a pecan half and garnish with orange zest. Note: You should have extra cranberry sauce.